If you’re planning to drive across Canada, make it an unforgettable road trip by visiting these 12 incredible, one-of-a-kind houses! From treehouses to a tiny house, a giant doll house and even a home made entirely of glass bottles, you won’t believe your eyes! If you’re a big fan of design, or love to marvel at the unexpected, you’ll want to hit the roads to discover these unique homes of Canada! Who hasn’t ever dreamt of staying the night in a treehouse? Vancouver Island’s Free Spirit Spheres are spherical cabins in the trees that combine the conveniences of modern life with the authenticity of camping out under the stars. Not to miss! Considered to be the first tiny house in Canada (and possibly the world! 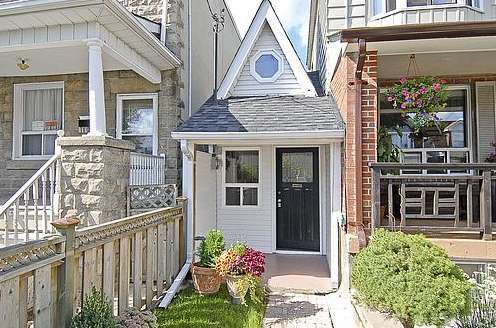 ), Toronto’s Little House was built in 1912 by Arthur Weeden. Originally designed as a laneway for cars, Weeden instead used the land to build his family home, where they resided 20 years. The house is so well known that Ellen Degeneres even gave it a shout out on her show! No, you’re not dreaming! This real architectural achievement at 54½ Saint Patrick Street in Toronto is half a home. It was built between 1890 and 1893 as one in a row of six identical residences for labourers living in a poor neighbourhood. In the 1950s, a real estate consortium set out to buy the homes, but the owner of 54½ refused to sell. Thus, the original facade was left intact so that it became one of the most unusual houses ever! A true architectural institution in Montreal, Habitat 67 was created and designed by architect Moshe Safdie as part of Expo 67. These playful, cubic homes were originally created to provide a new way of living in the city. Quite eccentric compared to downtown Montreal, Habitat’s 146 apartments are still a source of fascination and curiosity. Well worth the visit! Located at the tip of Newfoundland’s Great Northern Peninsula, Anse aux Meadows is the oldest evidence of a European presence in America. This Viking village dating back to the 11th Century, some 500 years before Christopher Columbus discovered America, includes eight timber-and-sod buildings. Declared a UNESCO World Heritage Site in 1978, it’s a truly exceptional historical site! Take a walk along Bertmount Avenue in Leslieville, and when you get to 37, you’ll understand why it’s called The Doll House. Rather than planting flowers in her garden, owner Shirley Sumaiser displays the dolls and stuffed animals that she’s been collecting for over 20 years. Changing with the seasons and holidays, the garden attracts tourists and photographers all year long! If you’ve ever driven on the Don Valley Parkway in Toronto, you’ve probably noticed this funny structure that’s known as the Cube House. Built in 1996 by architect Ben Kutner and his partner Jeff Brown, the structure was inspired by the Dutch Cubist architectural movement of the 1970s. Unfortunately, the land it sits on was sold to a real estate developer in 2016. Hurry! This may be your last chance to see it! Update November 2018 : Toronto’s bizarre cube house was torn down. It was in 1979, at the age of 66, that Edouard Arsenault began to clean and collect glass bottles to use them as building materials. Mission accomplished! Constructed using over 25,000 bottles, Mr. Arsenault’s three glass structures today include a house, a tavern and a church. Best seen on a beautiful sunny day! Part of the Thousand Islands chain on the Canada-United States border (but technically located in New York State), the Sizeland family bought Just Room Enough Island in the 1950s. The island takes its unusual name from this tiny piece of isolated land whose entire surface is taken up by a house, making it the world’s smallest inhabited island. Looking over a sea of ​​green fields in the heart of the Canadian prairies is a lighthouse. Yes, it’s true! Erected in the flatlands of Saskatchewan, the Cochin Lighthouse is fully operational, even though it has no real use there. To take in the expansive view of “the land of the living skies” from the top, you’ll have to climb the lighthouse’s 153 steps – excellent exercise that makes the view all the more rewarding! A must-see in the Quebec City region for 17 years now, the Hôtel de Glace – or ice hotel – has attracted more than a million visitors since opening! Entirely built of snow and ice, this ephemeral work of art is redesigned and rebuilt every winter. It’s also the only hotel of its kind in North America! Close to the Green Gables heritage site on Prince Edward Island, the Around the Sea Rotating House is truly one of a kind. You can rent one of the four condos in the world’s first rotating house to fully enjoy the unique experience, as the entire structure does a full rotation every 45 minutes. Every condo gets views of the sea throughout the day! How’s that for sharing? Canada has plenty of unique places to see, each with its one-of-a-kind history. Have you heard of or visited any of these houses? Or do you know of any others that you would like to share with us? Feel free to share your suggestions and addresses in the comments below.